Installed a high efficiency energy star rated heating and cooling system? Taken additional steps to reduce energy usage or conserve water? Do you attempt to minimalize waste by reusing and recycling? If you answered YES to most of these questions, you may qualify for Ewing Township’s new Green Business Recognition Program. Local businesses are invited to join the Ewing Green Business Recognition Program, a new Township project run in conjunction with the Ewing Green Team that will recognize businesses located in Ewing committed to environmental stewardship and sustainable business practices. This new program gives us an opportunity to both promote the work our outstanding local businesses already do towards keeping Ewing sustainable, as well as encourage future environmentally friendly practices. For local businesspeople interested, participation in the Ewing Green Business Recognition Program is easy. Contact Ewing Green Business Recognition Program Coordinator Evan Crumiller at evancrumiller@gmail.com or (609) 468-0462 to receive information on the program as well as the Ewing Green Business Checklist, which can be used to mark off actions taken to green a business. The checklist has actions that add up to 68 points in various areas of sustainability; including waste prevention, purchasing, energy conservation, water conservation, storm water management, landscaping and transportation/air quality. A business must have at least half to qualify as a green business. A Ewing Green Team member will come by to pick up the completed checklist, and if you have completed the pre-determined number of actions, you will be officially named a Ewing Green Business and added to the list of Green Businesses on the Ewing Green Team website and given a sticker to proudly display in your store. “The business leaders of our community deserve recognition for the work they do, and this effort will not only provide that recognition, but also incentives for local businesses to turn towards sustainable practices for the benefit of future generations of customers,” said Ewing Green Business Coordinator Evan Crumiller. If you have thought about making energy saving upgrades to your business but put it off because you thought it might be too expensive, we urge you to reconsider. With the NJ Clean Energy program’s Direct Install program, small business are able to recoup 70% (Yes! You read it right. 70%) of approved upgrades to your building. Check out our Direct Install page for more information and contact a member of our Energy Committee today to learn more. If you have any questions or comments about our Green Business Recognition Program, please call Evan Crumiller, Ewing Green Team at (609) 468-0462. Or you may email the Ewing Green Team directly at ewinggreenteam@gmail.com. 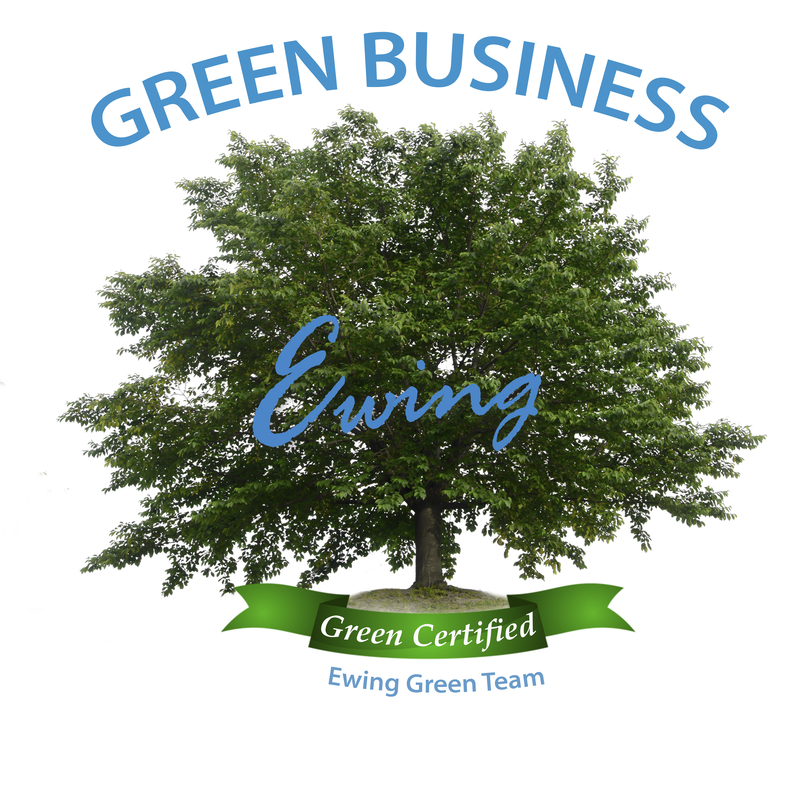 For a list of our recognized businesses and particulars about their sustainable business practices go to our Ewing Green Businesses page.